In an unplanned twist the battle of the Christmas Ales hits the internet on Thanksgiving. This is not a subliminal message to go out start your X’mas shopping early, quite the opposite. On this cold wintery day sit back and enjoy some good Winter Warmers while you wait for the afternoon Turkey feast. Let’s meet the contestants. Holly Jolly by Fatheads (North Olmstead, OH) – Fatheads is another Cleveland area Brewery. They are probably best known for their award winning Headhunter IPA, but they also took home three medals from this year’s Great American Beer Festival—Hop Juju Imperial IPA (Gold), Black Knight Schwartzbier (Silver), and Trail Head Pale Ale (Silver in the Fresh Hop Ale category). I was leaning toward using the better known Great Lakes Christmas Ale or Thirsty Dog’s 12 Dogs of Christmas, but those breweries are represented by other beers in this contest, and I limited my Ohio picks to one beer per brewery. Rin at Savor Market steered me to the Holly Jolly, which is another entrant in what could be called the Cleveland Winter Warmer substyle. Holly Jolly is brewed with Ohio honey, cinnamon, ginger, nutmeg and coriander. It’s vital statistics are 7.5% abv and 28 IBUs. 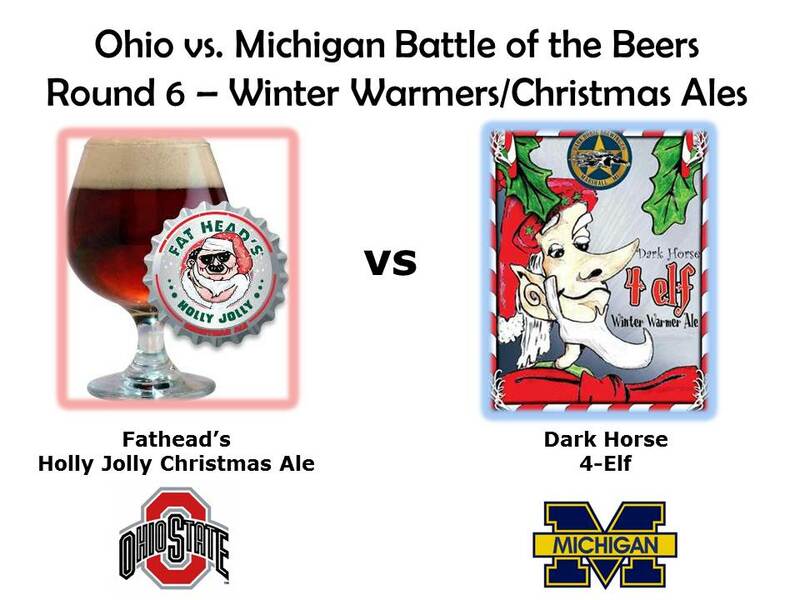 4-Elf by Dark Horse (Marshall, MI) – Finally we encounter another Michigan beer that isn’t from Founders or Bell’s. Dark Horse sends quite a few beers down to Columbus, probably the most sought after is their Plead the 5th Imperial Stout. While there are a plethora of Ohio Winter Warmers, there are not so many from Michigan. I was totally unaware of 4-Elf prior to this contest. I’ve got to thank Brad at Savor Market for pointing me in the direction of 4-Elf. According to the Dark Horse website it is 9.0% abv and made with nutmeg, cloves and allspice. As with all of the other rounds in this contest I give you two perspectives on the winner. We threw a party and invited a dozen ordinary folks (beer drinkers, but definitely not beer geeks) and had everyone choose their favorite of the two in a blind taste test. These results are captured in a short video shot live at the beer tasting party and found at the bottom of this post. I call this the People’s Pick. I also tasted the beers side by side and offer my thoughts and pick for the best beer. I call this Pat’s Pick. Depending on your affinity for beer you can decide which opinion best represents your tastes. Better yet go out and pick up each beer, try it for yourself, and leave a comment here to register your own vote for the winner. Holly Jolly is dark amber in color, but clear. The smell is bready, and slightly sweet, with a hint of spices and honey. The taste is malt forward, sweet up front but not cloying. The spice cabinet used to flavor this beer makes its presence known. Cinnamon was the easiest one for me to pick out, but the others were there. You can taste the honey just before the end, but the spices get the upper hand at the very end and linger on your palate. The mouthfeel is disappointingly thin. This is a beer that benefits from warming. Right out of the refrigerator it’s pretty disappointing, but as it warms the mouthfeel improves (gets thicker) and the honey becomes detectable in the aroma and taste. Back in October I tried Fathead’s Pumpkin beer, Spooky Tooth, and was not overly impressed. I have to say Holly Jolly seems like a pretty similar beer with a slightly different combination of spices, and honey replacing Pumpkin. 4-Elf is a different beer on many levels. It is completely opaque with a deep, dark walnut brown color and 1 finger of mocha colored head. The base beer here seems to be stout or a porter. The nose is chocolate, cloves, nutmeg, some dark fruits (raisins?) and some alcohol. The smell reminds me of a spiced chocolate rum cake. The taste follows the nose pretty closely. The cloves go well with the dark chocolate malt flavors. The mouthfeel is thick and chewy, completely superior to the Holly Jolly. Summing it up 4-Elf is a little bit like a Founders Porter with spices added and the alcohol turned up a bit. I’m going to have to try some of the other Dark Horse Stouts. This is the easiest pick for me so far. I was not very impressed with Holly Jolly. Although similar in style I don’t think it compares favorably to the better known Ohio Winter Warmers, 12 Dogs of Christmas Ale or Great Lakes Christmas Ale. On the other hand, 4-Elf was a revelation to me. I love the combination of chocolate and the spices. It’s my new favorite Winter Warmer, and the hands down winner. Given the prevalence of Winter Warmers in Ohio, and the popularity of Great Lakes Christmas Ale, I think many of us expected this style category to be an easy win for the Buckeye state. So this result comes as something of a surprise (reminiscent of the 1996 OSU-Michigan game). Ohio beer lovers may be questioning my choice of Holly Jolly, and I can only imagine that some of you are calling for my resignation. To allay those criticisms I took the hit of drinking a Holly Jolly, a 4-Elf, and a 12 Dogs of Christmas Ale sequentially while writing this review. While the 12 Dogs is superior to Holly Jolly, in my book it’s still not as good as the 4-Elf. On a 1-10 scale I give Holly Jolly a 5.5, 12 Dogs of Christmas Ale a 7.5, and 4-Elf a 8. See the video above for the people’s pick. Here I’m joined by Laura, who is obviously torn in her college football loyalties, but her keen senses are on display when she correctly identifies the spice common to both beers (nutmeg). Our audience once again behaves like the Florida electorate in the 2000 presidential election. Without the services of Katherine Harris we stumble on as best we can.